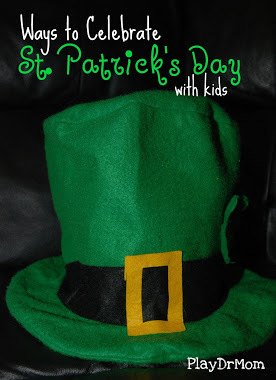 Be sure to check out my post from last year with fun ideas such as making a leprechaun trap, an indoor gardening project of growing “hair” for your own little leprechaun, going on a St. Patrick’s Day treasure hunt, St. Patrick’s day snacks, St Patrick’s Day sensory bin, a green scavenger hunt, and turning white carnations GREEN. Make a Sticky Paper Shamrock collage of green! You know where you find a pot of gold? That’s right … at the end of a rainbow. Here’s a Round Up of Rainbows and another made out of pipe cleaners & an egg carton! And how about a Shamrock Sticker Resist Painting?